Log into the /appliance administrative interface for your primary appliance, accessible from either its unique hostname or IP address (e.g., https://site1. example.com/appliance or https://192.168.1.50/appliance). Because NAT directs the IP for the support site domain, support. example.com, to this IP address, this is the primary appliance. Log into the /appliance administrative interface for your backup appliance, accessible from either its unique hostname or IP address (e.g., https://site2. example.com/appliance or https://192.168.1.51/appliance). 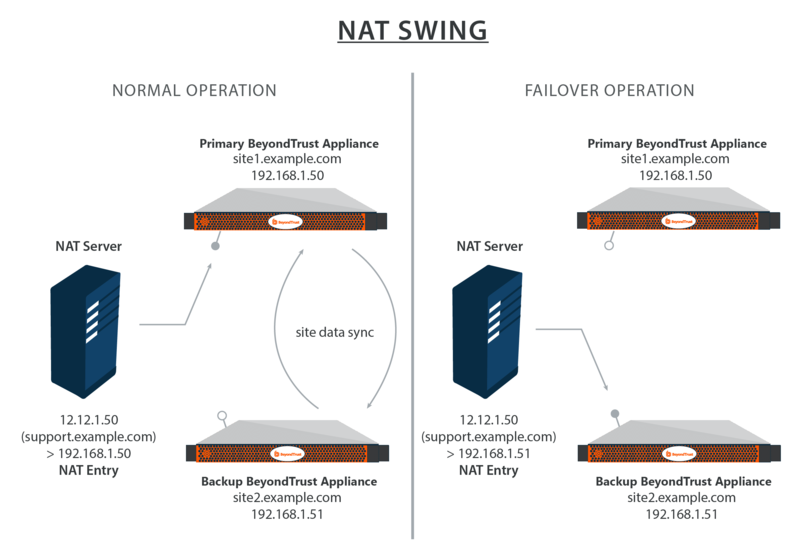 To failover, access the NAT controller and locate the NAT entry for your support site (e.g., support.example.com). Edit the entry to point to the backup IP. Click Become Primary from the backup appliance Failover page. As soon as the NAT change is made, you can resume normal support activity. All requests to your support site will be served by the backup appliance.